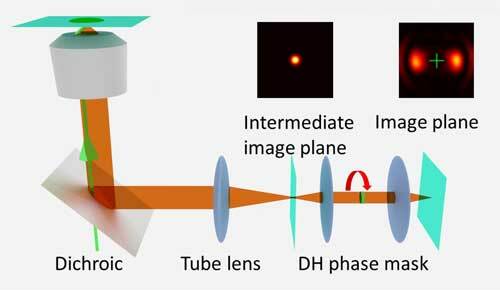 (Nanowerk News) A new Rice University technique grabs images of chemical processes that happen faster than most laboratory cameras are able to capture them. The technique, super temporal resolution microscopy (STReM), allows researchers to view and gather useful information about fluorescing molecules at a frame rate 20 times faster than typical lab cameras normally allow. The work by Rice chemist Christy Landes and her team, along with Rice electrical engineer Kevin Kelly, appears in the American Chemical Society's Journal of Physical Chemistry Letters ("Super Temporal-Resolved Microscopy (STReM)"). The Rice researchers start with a Nobel-winning microscopy technique that views objects like molecules at "super resolution" - that is, things below the diffraction limit that are smaller than most microscopes are able to see. "Super-resolution microscopy lets us image things smaller than about half of visible light's wavelength - around 250 nanometers," Landes said. But she noted a barrier: "You couldn't take pictures of anything faster than your frame rate," she said. The Rice lab's new enhancement, which uses a rotating phase mask to encode fast dynamics in each camera frame, will help researchers understand processes that occur at interfaces like adsorption and desorption of proteins or molecules' trajectories as they move along two-dimensional surfaces. Typical charge-coupled device (CCD) cameras max out at frame rates of 10 to 100 milliseconds, Landes said. While other techniques like electron microscopy can see materials at the subnanoscale, super-resolution microscopy has a distinct advantage for fragile samples like biomolecules: It doesn't destroy them in the process. The technique manipulates the phase of light to give the image at the detector a more complicated shape. This process had previously been used by other researchers to encode where the object is in three-dimensional space within an otherwise two-dimensional image. The Rice lab's contribution was to note that by manipulating the phase over time, it would also be possible to encode faster time resolutions within a slow image frame. Thus, the group designed and built a spinning phase mask. The resulting images capture dynamic events that happen faster than the camera's intrinsic frame rate. The shape of each image within a frame effectively gives it a unique time stamp. The technique takes advantage of a characteristic of microscopy familiar to anyone who's ever taken a blurry picture. Point spread functions are a measure of the shape of images both in and out of focus. When the subjects are as small as single molecules, shifting in and out of focus happens easily, and the size and shape of the resulting blur can tell researchers how far from the focal plane the subject is. Phase-mask engineering makes it possible to make focus-dependent blur easier to detect by introducing distinct point spread functions. On film they look like the lobes of a barbell and rotate with respect to focus. STReM uses point spread function changes from the spinning mask to collect temporal information, Landes said. With the new technique, changes in the lobes' angles reveal the time an event has occurred within each frame. "The purpose is to allow scientists to study fast processes without the need to buy faster and much more expensive cameras," said Rice graduate student Wenxiao Wang, lead author of the paper. "This involves extracting more information from single images." Landes, who recently won ACS's prestigious Early Career Award in Experimental Physical Chemistry for her work to integrate super-resolution microscopy with information theory to understand protein separations, said designing and building the mechanism cost the lab only a few hundred dollars, a fraction of the cost of buying a faster camera. The phase mask is based on work by Kelly, who drew upon his contributions to Rice's single-pixel camera to design what amounts to a piece of plastic with variable thickness that distorts light en route to the CCD. "Like the single-pixel camera, we're doing compressive analysis," Landes said. "With the static phase mask, three-dimensional information is compressed into a 2-D image. In this particular case, we have compressed faster information into a slower camera frame rate. It's a way to get more information in the pixels that you have."